"I think tonight we came out ready to play," said Maple Leafs forward Mitch Marner, who scored a goal. "We know they've got a good team over there ... so we knew coming in here was going to be a hard match and I think we came in, got the puck behind them which is what we needed to, and that's why we were successful." This wasn't much of a game after John Tavares, Auston Matthews and Patrick Marleau scored in the opening 13:38. 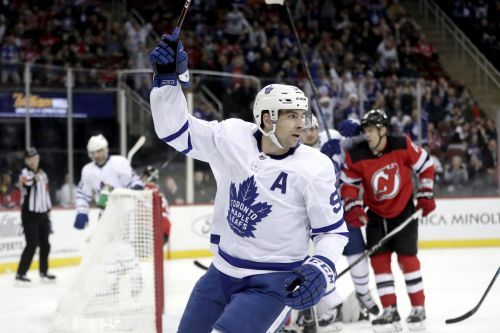 Nazem Kadri matched his career high with three assists, Marner and Morgan Rielly added second-period goals and Tyler Ennis had two in the closing minutes as Toronto embarrassed New Jersey for the second time this season. The win was their seventh in 11 games (7-2-2). "For us, we hadn't been getting the results we've wanted to get over the past week, week-and-a-half, and it was about time for us to stand up and I thought we responded well," Kadri said. "Tonight is not something you can just look past," Devils coach John Hynes said. "We have to dig into it and get some answers." The Maple Leafs took the lead just seconds after the Devils' killed off Blake Coleman's penalty. "I don't know if we maintained it for 60 (minutes) but we really started good, came out, got on the cycle and scored some big goals," Toronto coach Mike Babcock said. "Good win for our team." Vatanen scored on a rising slap shot with 1:16 left in the first period but Marner pushed the lead back to three goals, putting in the rebound of Tavares' shot that banged off the goalpost. Rielly scored from the left circle with less than a second left in the second period. "Our group in here, we can't take nights off. Tonight was not our best," Devils forward Taylor Hall said. "When we don't play our best, unfortunately right now, we're not going to get wins. NOTES: The Leafs are 13-5-1 on the road. ... Marleau's goal was the 544th of his career, tying him for No. 30 in NHL history with Maurice Richard of the Canadiens. ... Tavares has 14 of his 21 goals on the road. ... Marner has 16 points in the last 11 games. ... Hall returned to the lineup after missing two games with a lower-body injury. ... Vatanen's goal was his first in 19 games. ... Devils have been outscored 13-3 by the Leafs.